Adult & Child Health joins hundreds of organizations across the nation in promoting April as Child Abuse Prevention Month. Every year, more than 3 million reports of child abuse are made in the United States. The trauma of child abuse has life-long effects on survivors and leads to a higher risk of health and wellness problems later in life. The rates of abuse and neglect are particularly staggering in Indiana. A new report from the Children’s Bureau of the U.S. Department of Health and Human Services shows Indiana had the second-highest rate of child abuse in the nation (18.6 victims per 1,000 children) in 2017, the last year that statistics were available. That’s more than twice the national average (9.1 per 1,000). Adult & Child Health aims to bring those numbers down with its resources and services. Our Community Based Treatment, School Based Services, Open Access program, Integrated Care and Addiction Services provide an element of mental health treatment that often stems from child abuse and neglect. These programs also provide prevention measures to decrease risk of future abuse and neglect. According to a Harvard University study, 53% of adults who experienced child abuse, neglect or verbal abuse dealt with depression, and 40% experienced PTSD later in life. At Adult & Child Health, we live out our mission every day. “With hope, compassion and creativity, we deliver life-enhancing physical, social and behavioral health care services.” That includes children in our Therapeutic Foster Care team and any child who has been victimized by child abuse or neglect. Additionally, our Therapeutic Foster Care team places children who have been subjected to abuse or neglect in loving, caring homes every day. “Research shows that protective factors are present in healthy families,” said Lynn Farmer, community outreach development specialist who works with A&C’s Therapeutic Foster Care program. “Promoting these factors is among the most effective ways to reduce the risk of child abuse and neglect. These factors are: nurturing and attachment, knowledge of parenting and of child and youth development, parental resilience, social connections, concrete supports for parents, and social and emotional competence of children. 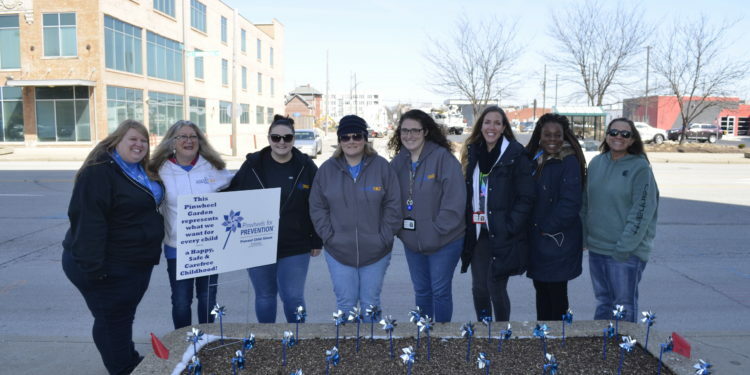 Monday, to kick off National Child Abuse Prevention month, members of Adult & Child Health’s Therapeutic Foster Care team walked to the statehouse. They listened to speeches by Indiana Gov. 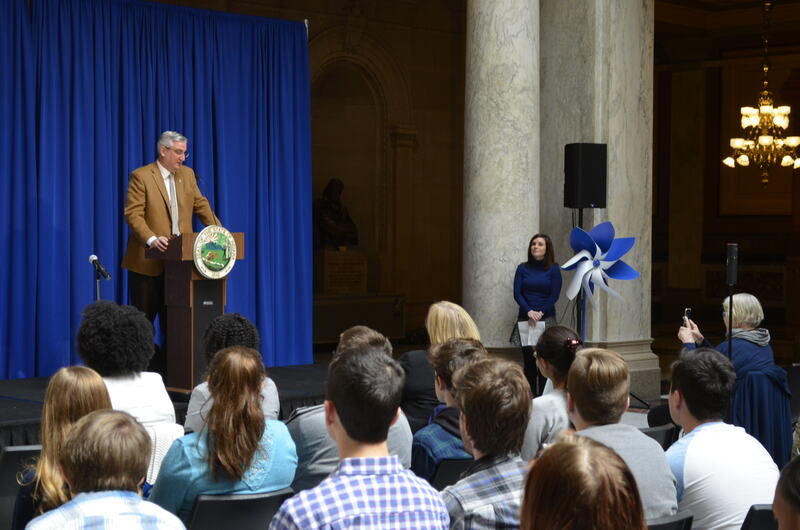 Eric Holcomb and others about the importance of combating child abuse and neglect. Indiana Gov. 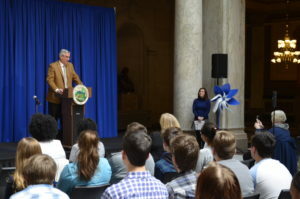 Eric Holcomb speaks April 1 at the Statehouse about child abuse prevention efforts in the state. Adult & Child Health has also planted blue and white pinwheels near the entrances to several A&C locations to raise child abuse awareness. “Our foster care program receives, on average, 450 referrals each month, and our occupancy rate among foster families is 95 to 98 percent. Although we aren’t provided the reason for the referrals, but “if the child is referred to foster care, there is very often a history of abuse or neglect,” Farmer said. We encourage everyone to do their part to bring Indiana’s child abuse statistics down. Don’t let one more innocent child become a statistic. If you want to learn more about how to become a foster parent, or learn more about our Therapeutic Foster Care team, visit our website at indyfostercare.org. About Adult & Child Health: Adult & Child Health strives for caring communities, where every child, adult and family has the opportunity to live healthy, happy lives. Accredited by the Joint Commission, Adult and Child is leading provider of life-enhancing physical, social, and behavioral services in central Indiana. For more information about Adult & Child, please contact Adam Wire, marketing and communications specialist, at 317-882-5122 or awire@adultandchild.org.